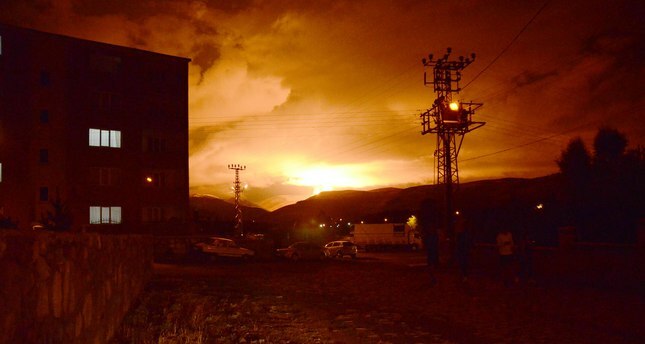 PKK terrorists attacked the Baku-Tbilisi-Ceyhan natural gas pipeline (BTC) for the third time, the latest attack taking place on Monday night at around 10:00 p.m. local time. A group of 20 terrorists attacked the pipeline going through the village of Yabasan in the district of Sarıkamış in southeastern Turkey's Kars province. Governor of Kars, Günay Özdemir, confirmed that the terror attack was carried out by the PKK. The PKK terrorist organization is known to have launched many attacks in the region, targeting the pipelines. The terrorists made their first attack on May 29, 2012 and the second on August 4, 2015. On the terrorists' third attack launched from two points, an explosion occurred at the pipeline, with flames rising as high as 150 meters. The locals in the area panicked, but the fire teams were able bring the fire under control later in the night. The security forces have launched a wide-scale operation in the region to track the terrorists.